I'm looking for an old paranormal/horror TV show that featured two unrelated paranormal stories after an introduction by a man in a manor (he was standing in a darkened room, maybe candle lit and there were lightning that occasionally flashed) that I used to watch when I was a kid (aired during the 90s but could have been an 80s show). "You're in a house. Maybe your own...maybe one you've never seen before. You feel it. Something evil. You run, but there's no escape...nowhere to turn. You feel something beckoning you...drawing you into the terror that awaits you in the Darkroom!" As Coburn's voiceover reached the point with "no escape...nowhere to turn," the camera turned toward various walls and closed doors. From my own memory (I saw many of the episodes when they aired, and have seen pieces on YouTube subsequently) Coburn would also do short introductions to the individual segments, of which there were typically 2-3 per episode. 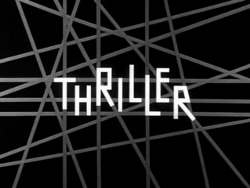 It may be "Thriller", hosted by none other than Boris Karloff. It ran in the early 1960's. The host (Karloff) did his introduction from different places, usually one that related to the stories. The stories on a given show would each have a similar theme - same type of crime, or ghosts or whatever.